I approached by heading south from the base of chair 8, cutting across several creeks to the arm then heading down to the White Salmon river. It looked ok on google earth, but I hadn't done it before, and had some anxiety that it wouldn't work and my plans for the day would be lost. It turned out well,�all snow cover from the edge of the resort. The North Face was in good condition, and should be for a while. 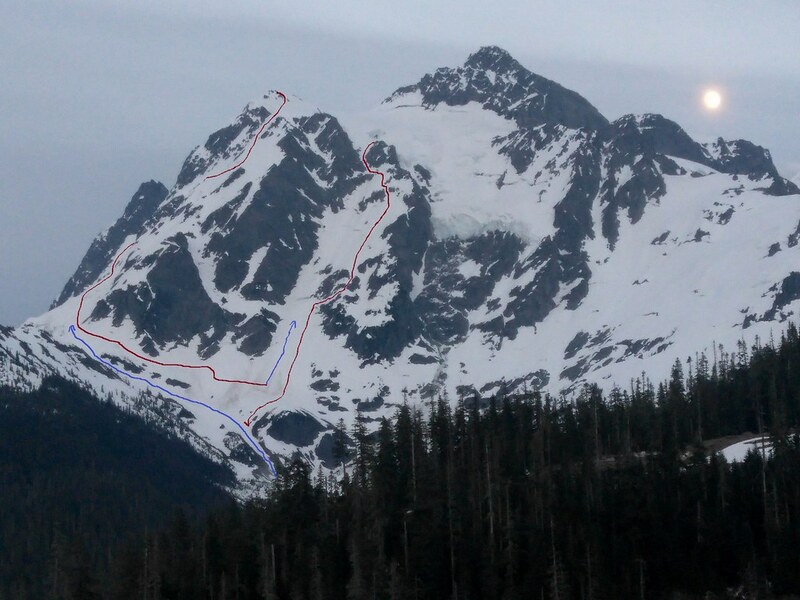 There were recent�tracks from two snowboarders who had booted over from the White Salmon. I enjoyed a nap and cup of tea�on the north shoulder, soaking in the alpine beauty. The skiing was good, though sluff management was very important, sluffs at every turn, several of them growing quickly to large thundering avalanches sweeping the lower face. "This face, especially with such perfect conditions reminds me of what I love about skiing." -Sky Sjue, words from�his 07 NF�Shuksan�trip report.� While conditions�were�not perfect, I felt Sky's words to ring true, there is magic on that face. I hadn't planned on climbing and skiing the Northwest Couloir, but I was feeling pumped from the North Face descent, so I decided to give it a go. The main, winter/spring route in the NWC is currently�riddled with deep runnels and large cracks, though�I had spotted a way around�that I thought might work.�A low�traverse to the right, staying�climbers right in the couloir�until the high traverse. The low traverse was steep, exposed and icy. It was a stark contrast from the relative�comfort of the apron,�I was�scared and almost�called it quits�but kept pushing on. For the meat of the route, conditions were mostly boot top slush as�on the North Face.�There were areas of ice and rotted snow on and near the high traverse, but it all seemed manageable. I topped out and took a quick breather, I was feeling haggard but I didn't want to hang around too long,�clouds were rolling in�from the west and the sun was getting low. The descent felt more serious than the North Face because of the patches of ice and rotted snow.�Again I�set of sluffs that quickly ran the length of the couloir gathering a lot of snow along the way, sluff management was necessary. I felt relieved that the snow on the lower traverse had softened somewhat in the late day sun and skied well. After skiing over a bridge and a couple runnels the consolidated apron was�really�fun to ski, no worries of sluff catching up to me. I had taken some photos along the way�but my camera apparently flew out of my unzipped pocket high on the NWC. I made it back to the car with enough light to�snap a photo with my phone, it does not show the terrible current conditions of the standard NWC route. Oh man! Almost makes me want to take the skis out of storage. Cool report Dan! Are you going to start climbing again? Dan for the next Wheaties box. Bravo. She's a very special mountain. I had taken some photos along the way�but my camera apparently flew out of my unzipped pocket high on the NWC. Hey John! I don't know if I'm going to get back into it, but we should climb sometime soon, Castle Rock? I'll send you an email. Mosetick, Yeah it was a bummer to loose that camera, also felt foolish having dropped/lost anything, but as far as loseing something in the mountains goes, definitely not the worst thing that could have gotten away. I felt better when I made it back to my car just in time to catch the moon rise in the fading light. Great to see Dan's adventures again - love the lines and the classic Dan "camera" work.